Hello everyone! I am so sorry for not posting for 3 days, life has been cray cray! Between work, the baby and everything else, there just wasn't enough time in the day to get everything done but I missed you guys so much!! I'm very excited about this mani, it's my favorite that I've done so far. I ordered a whole bunch of nail bling off of ebay and part of it was some adorable fimo cane. This stuff intrigued me to no end so I had to get some. Then when I found this sweet shade of yellow from Sally Hansen Hard As Nails called Hard Lemonade, it wasn't too much of a jump to come up with this mani. 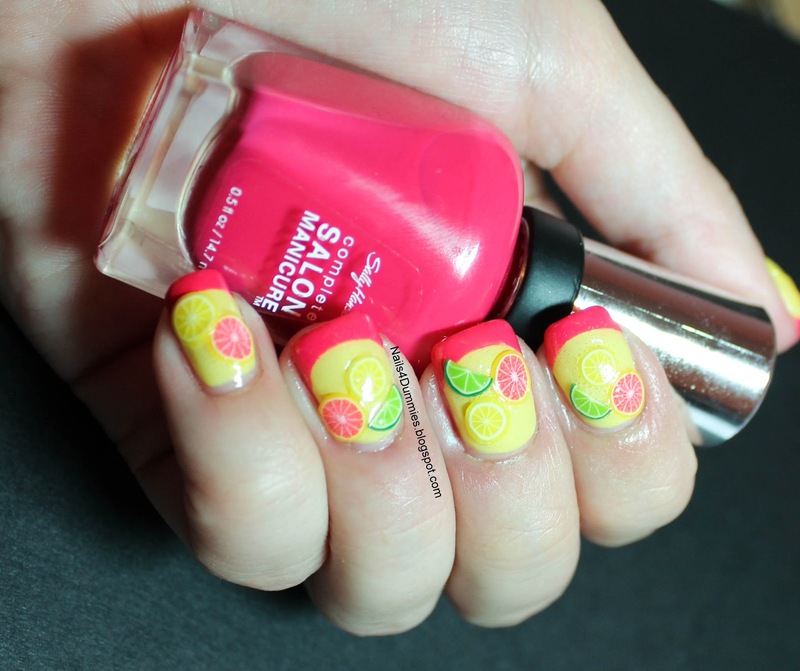 I added on some tips with Sally Hansen Complete Salon Manicure in Frutti Petutie which is a very bright, beautiful pink. What do you guys think? Please forgive the awful bubbles, I'm having topcoat woes! I really love Sally Hansen InstaDry but it gets all gloopy before the bottle is half gone and for $5.99 a bottle I don't want to be buying a new bottle each week so I need to do some research. I've heard excellent things about Seche Vite and a blogger friend just uses some restore-stuff (technical term there...aherm) when it gets thick so I may give that a go! I think I love fimo cane! I also gave my 5 yr old daughter a fimo mani with little animals and it looked so sweet on her tiny little fingers! Thanks Jazz! Seche also sells a product that's called Restore that you can use once it thickens up! Might be worth a try! This is so cute! How do these things work? Like stickers? You didn't have a problem with them falling off? I'm also intrigued! Thanks Nee-Nee! They are like tiny, flexible pieces of rubber/plastic/clay like stuff, lol! Then you just put them on with some clear polish like you would with a rhinestone. I can't say how long they stay on as I removed them not long after but the ones I did on my daughter have been on for 2 days and only one has fallen off and that's with just one coat of top coat! Seche vite is the greatest TC evaa!! I know some don't love it but as long as u wrap ur tips it doesn't shrink and the quick dry and glossiness of it are just hands down the best!! 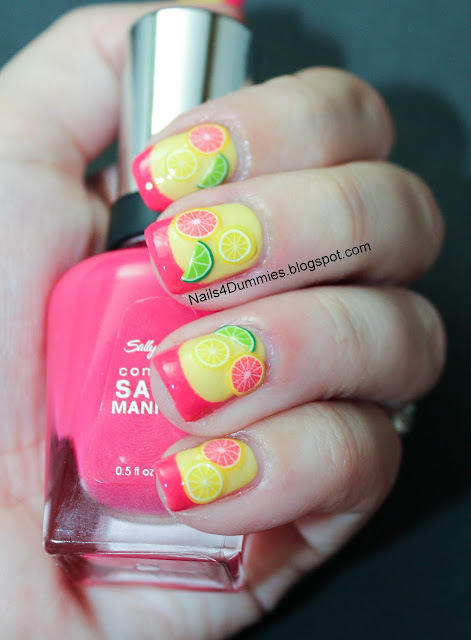 Love this mani- haven't tried Fimo. Do u cut them yourself? I see them in long sticks?! Very cute!! I certainly need to try Seche Vite. You can buy them in canes and cut them yourself but I wouldn't In order for them to work well they have to be VERY thin and I would worry about cutting them myself although I think you can also buy fimo cutters. They were pretty cheap though off of ebay and its worth it to me to not have to cut them myself! Plus that way they came in little wheels! This is gorgeous!!! It puts me in a summery mood for sure. 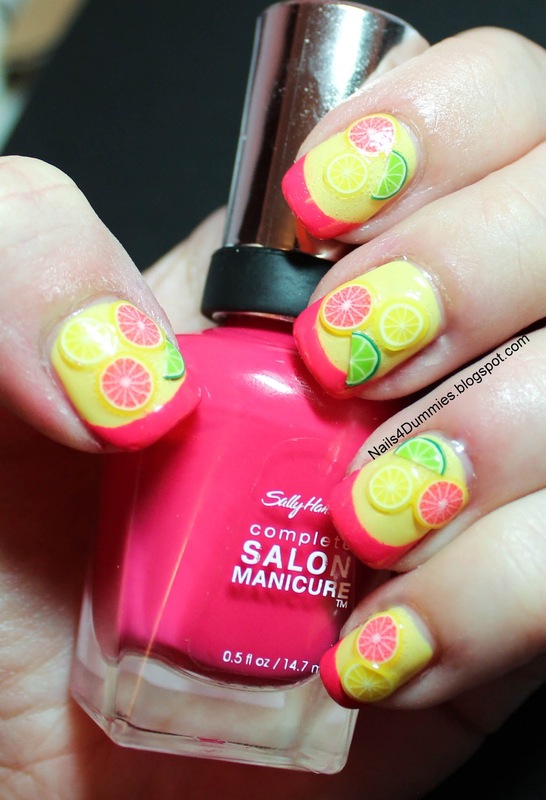 I have been wanting those fimo fruit slices forever, perhaps I will pick some up soon! Everyone else is doing fall and Halloween but I can't give up on Summer yet! Too bad we already had one snowfall! You really do need to get them, they're so cute and tiny! Thank you! It makes me want to scream! I need to find a thinner and try that. Thank you so much!!!! Hopefully I will find a solution to the problem or a better top coat that's not too expensive! Very cute, I love the bright summer colors!! Seche Vite is the BEST, I've tried others, but SV is hands down the best - you will love it! !